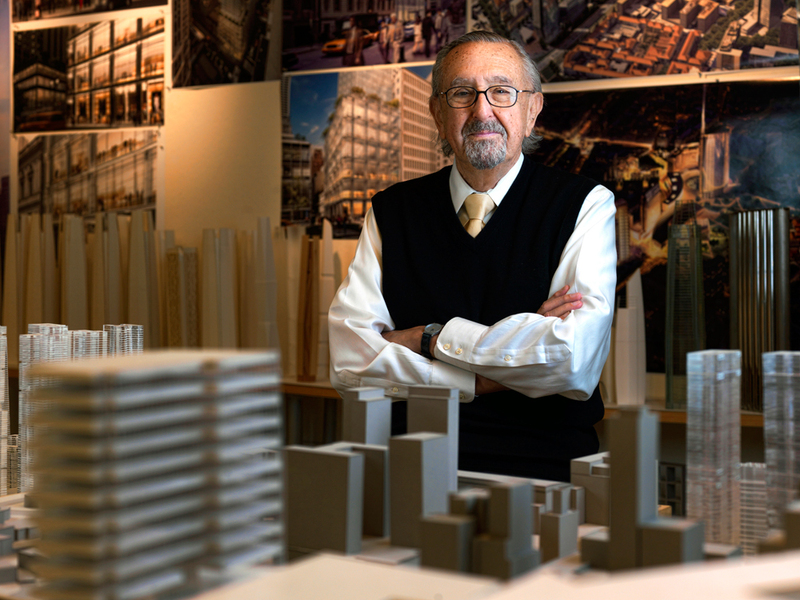 Cesar Pelli was born in Argentina where he earned a Diploma in Architecture from the University of Tucuman. He first worked in the offices of Eero Saarinen serving as Project Designer for several buildings, including the TWA Terminal at JFK Airport in New York and Morse and Stiles Colleges at Yale University. After this apprenticeship, he was Director of Design at DMJM and, later, Partner for Design at Gruen Associates, both in Los Angeles. Throughout these years, he designed several award-winning projects, including the San Bernardino City Hall in San Bernardino, California; the Pacific Design Center in Los Angeles, California; and the United States Embassy in Tokyo, Japan. In 1977, Mr. Pelli became Dean of the Yale University School of Architecture and also founded Cesar Pelli & Associates. He resigned his post as Dean in 1984 but continues to lecture on architecture. Since the firm’s establishment, Mr. Pelli has worked with his Principals to originate and direct the design of each of its projects. In 2005, in recognition of the increased role of the firm’s principals, the firm was renamed Pelli Clarke Pelli Architects. Mr. Pelli has avoided formalistic preconceptions in his designs. He believes that buildings should be responsible citizens and that the aesthetic qualities of a building should grow from the specific characteristics of each project such as its location, its construction technology, and its purpose. In search of the most appropriate response to each project, his designs have covered a wide range of solutions and materials. Mr. Pelli has written extensively on architectural issues. In 1999 he wrote Observations for Young Architects, published by the Monacelli Press. His work has been widely published and exhibited, with nine books and several issues of professional journals dedicated to his designs and theories. He has received twelve Honorary Degrees, over 200 awards for design excellence and is a Fellow of the American Institute of Architects, a Member of the American Academy of Arts and Letters, the National Academy of Design, the International Academy of Architecture, and of l’Academie d’Architecture de France. In 1995, the American Institute of Architects awarded Mr. Pelli the Gold Medal, in recognition of a lifetime of distinguished achievement in architecture. In 2004, Mr. Pelli was awarded the Aga Khan Award for Architecture for the design of the Petronas Towers, Kuala Lumpur, Malaysia.